Most people think of having to get on their knees and scrubbing when they think of cleaning their pool. 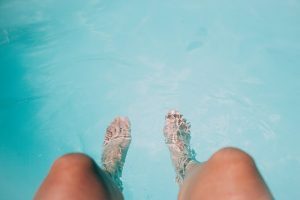 Although the thought of cleaning your pool after a whole season of not using it seems unpleasant, BD Pools and Spas says that it doesn’t have to be. This article goes over how to clean a pool after winter so that you can get your pool nice and clean for the upcoming swim season. One of the best ways to save time while cleaning your pool is to set up a simple schedule for all your pool related tasks and maintain it. Most pool chores fall into a daily, weekly, or monthly routine. Set up one weekly chore with each day filled with different pool tasks, and consider adding the monthly tasks on a day when you know you’ll have the time to do them. By keeping a strict swimming pool maintenance schedule, you will avoid the unexpected trouble and having to clean up a bigger mess the longer you wait. A pool cover that is simple to set up and easy to remove can help you keep your pool clean when you aren’t using it. Since most people who use a pool have hours or days when the pool is not in use, keeping it covered can reduce the debris and mess that your pool accumulates. While putting a cover on may take a little bit of time, it will cut down significantly on cleaning tasks that you would normally have to accomplish before you start using the pool again. Automated pool cleaning robots, vacuums, and skimmers can save you the time and hassle of doing these jobs manually. While a robot cannot complete all pool cleaning tasks, setting one up for the tasks that you can walk away from to get other household chores done is a great way to squeeze a little bit of extra time into a day. Some robots can do a full pool cleaning and filtering job themselves, while others may only be suitable for handling part of the cleaning task. equipment, tool and devices that are especially designed for swimming pool cleaning. Looking for how to clean a pool after winter? No help short of hiring someone else to do it can eliminate pool chores completely. However, setting a solid schedule, using a cover, and trying some automation can go a long way toward reducing the time pool cleaning takes — especially after a season of not using it. The right planning and equipment can make getting your pool cleaning a minor part of your day.